Everyone likes to personalize their desktop and stylize it the way they want. The theme you have at your desktop screen looks like tells about you. There are many ways through which one can customize their desktop with a default gadget, widgets, screensavers, and wallpapers. We have a list of Rainmeter skins from the sites that suit for all kind of users. 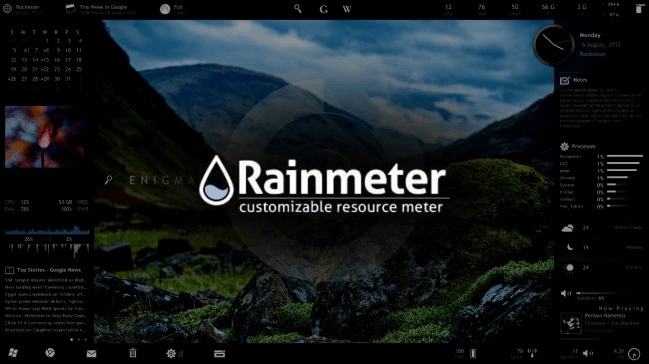 Rainmeter is a great open-source windows customization tool that easily customizes your desktop and the overall look. A user can shift through without changing their wallpaper every time. 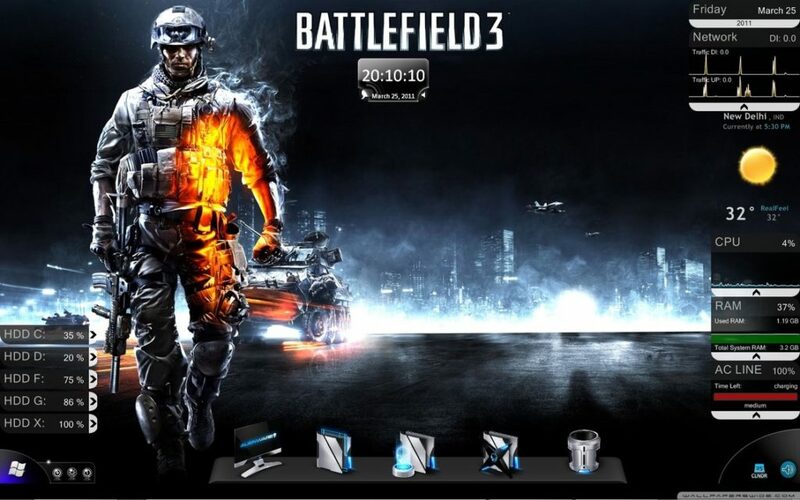 The Battlefield 3 is a hugely popular game comes to fore in Rainmeter theme. It comes with a slick custom sidebar on the right side of the screen. You can custom the date and clock widget on the screen with a live streaming weather updates. Gamers who want to customize their PC into a full-fledged gaming console can definitely try this theme to attain some cool visual effects. The TECH-A is both versatile and amazing. It can display some essential information in a form of widgets. It arranges systematically the usage of CPU, Time & date, shortcuts to the system folders. The sub-modules replete with minute drop shadows. It is a quite sight to behold. The components have a predominantly rectangular appearance which as a consistent appeal to the skin on your desktop. 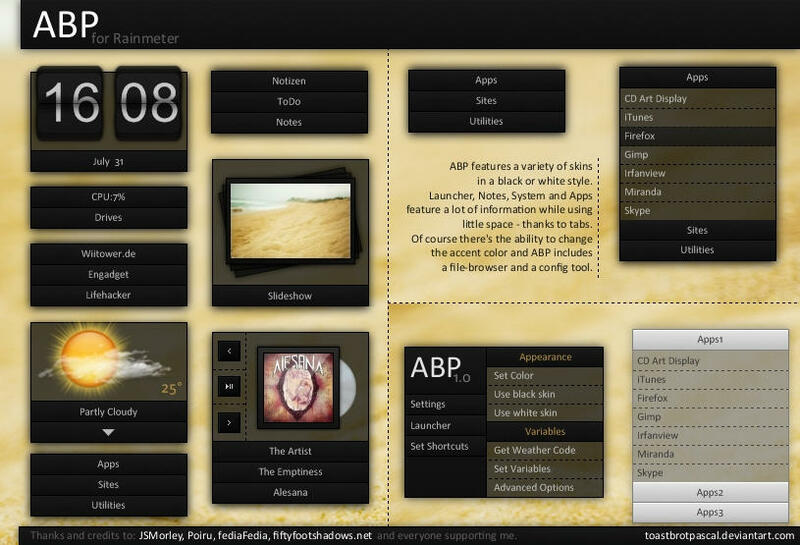 The widgets from ABP has got it all fromcurrent media information to your current stats. It seamlessly display everything. It is a rare best rainmeter skin. They were drawn directly on the desktop background. With the right wallpaper to be discrete. It is a quite neat looking skin that features information-displaying modules as CPU/RAM usage an newtork banwidth consumption. It is a very attractive rainmeter skin. It is one of the best skins that you can find over the web. Two different faces are there like a setup which has separated according to the color. It makes the wallpaper even cooler that you can’t get your eyes off from your screen. It contains widgets like clocks, Weather, CPU performance and so on. It is a heavy Rainmeter theme so that you may need a pc with good specifications. These are the best way to customize your desktop. You can download the Rainmeter on your windows and start customization. There are many lists of the skins are endless. 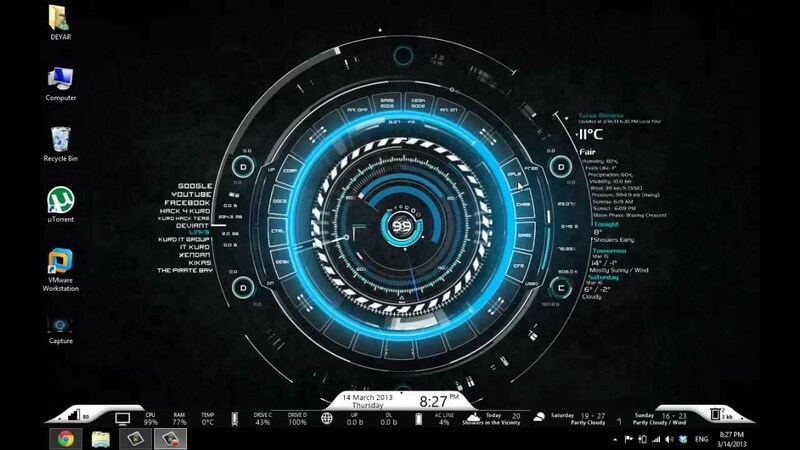 But this has the best rainmeter skins for windows You can also mix two or more rainmeter skins if you want to step up your game..